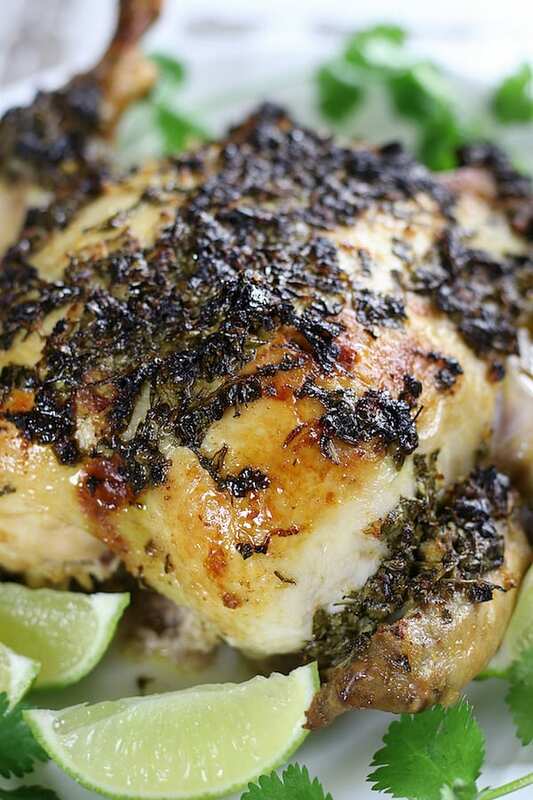 Cilantro Lime Mexican Roast Chicken recipe creates crazy delicious, tender and juicy chicken. Works great as the main dish or as the protein in many Mexican dinners. Did I ever tell you how much I love the ease and simplicity of having a whole roasted chicken for dinner? For many it feels very awkward even thinking about what to do with a whole chicken. I think because of this, the trend the last few decades has been all about cooking chicken breasts. If your new to cooking a whole chicken let me introduce you to the beauties that is the whole chicken. 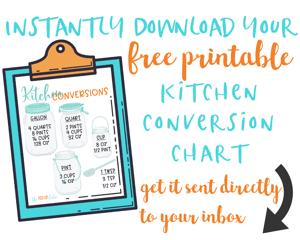 You can make many meals off of one bird thereby keeping the food budget down. Roasting a whole chicken tends to create super juicy meat because of the chicken skin. All kinds of flavor can be imparted into a whole chicken by either marinating, brining or placing an herb rub under the skin. 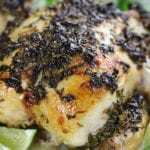 Some of my favorite flavorful whole chicken recipes are Rosemary Lemon Garlic Chicken, Greek Chicken and Instant Pot Cherry Chicken. A whole chicken is perfect for a Sunday dinner because it can feed many people (depending on the size of the bird) and it is super easy to make. 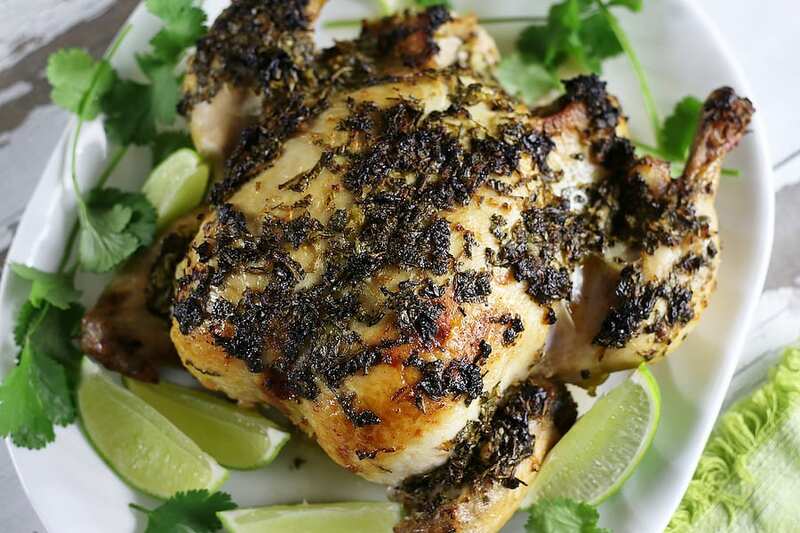 The beauty of this cilantro lime marinade is that it is extremely easy to make. 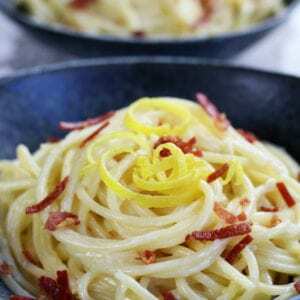 Simply whisk together the olive oil, lime juice, salt crushed garlic and coriander. Wash and chop the cilantro and then stir into the marinade. Finding a container to accommodate both the whole chicken and the marinade can be a bit tricky. What works perfectly for me every time is this container. I mix the marinade in it and then submerge the chicken, bottom side down, into the container. Make sure to spoon marinade over the top chicken and into its cavity. Cover with plastic wrap and refrigerate. Halfway through marinating flip the chicken over to ensure the other is fully submerged. One other option for marinating the whole chicken is to use 2 Gallon Freezer Bags, and to turn the chicken over halfway through marination. Just as a side note, the 2 gallon sized bags are not always easy to find at the store and the gallon size will be too small. Both brining and marinating involve similar actions of soaking the chicken in a flavorful liquid. The main difference between the two, a brine tends to be more of a water, salt and spice mixture that helps increase moisture and tenderness. However a marinade has oil, acid, herbs, spices, aromatics and sometimes sugar that not only increases moisture and tenderness of the meat, but also can pack a huge punch with flavor. 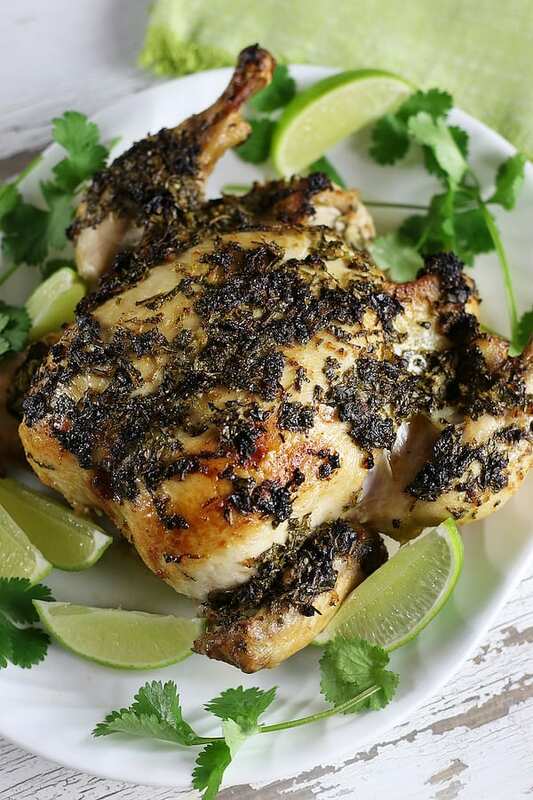 This Mexican Chicken Marinade using olive oil for its fat, lime juice for the citrus, garlic for the aromatics and cilantro and coriander for the herbs and spices. I have found sugar not to be necessary, but can definitely be added. I highly recommend marinating this no less than 12 hours, preferably 24 hours. If you have the time, 48 hours will dramatically increase the flavor that is infused into the meat. I love whisking up the marinade on a Friday afternoon and roasting this chicken for Sunday dinner. For those who love spicy foods you have a few options to help really kick up the heat. For a more mild heat dice up 1-2 fresh jalapeños or for a stronger heat 2 or more habaneros diced with the seeds. Also, adding 1/2-1 full tablespoon of chipotle powder will help to increase the spicy factor. For whole chickens in the 4-5 lb range a smaller roasting pan is all that is needed. To roast, preheat oven to 350℉. Place the marinated chicken, breast side up, into the roasting pan. The most important step, spread congealed olive oil over the top of the chicken. This helps to create a beautifully golden crust. Pro Tip: Congealing means the olive oil will have separated from the lime juice and solidified together with the fresh cilantro. The cilantro will darken in baking. If this bothers you simply remove before serving. 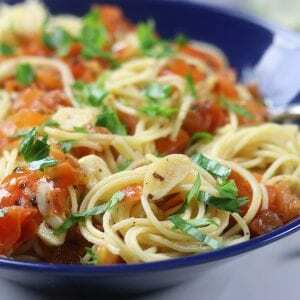 Anyone getting ready for the bathing suit weather that is right around the corner generally finds keeping track of total calories consumed an important step to help prepare. Here is a breakdown in supporting those weight loss goals. 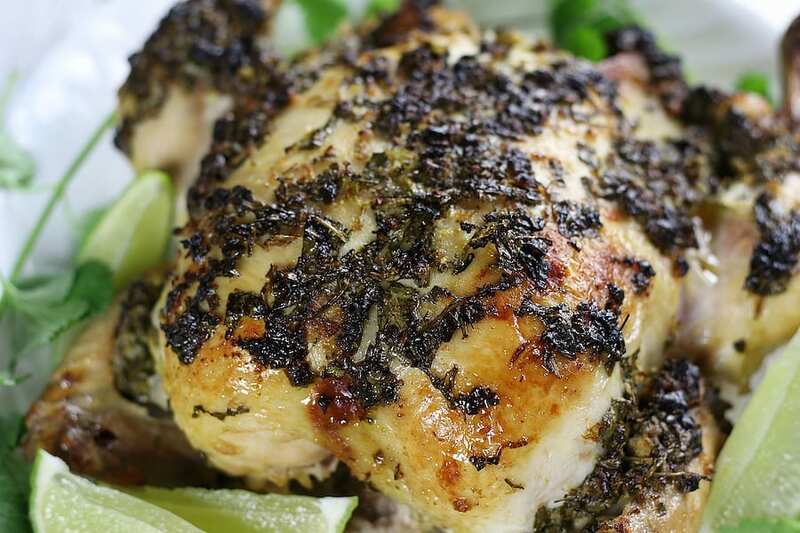 4 oz portion from the chicken drumstick or leg of this Cilantro Lime Mexican Roast Chicken is approximately 216 calories. 4 oz portion of the chicken breast is approximately 188 calories and a 6 oz portion is approximately 284 calories. 4 oz portion of chicken thigh is approximately 236 calories. Pro Tip: 1 oz of meat is about the size of a tube of lipstick and 4 oz it a touch bigger than a deck cards. This Mexican Roast Chicken is extremely versatile as a main dish, as are the leftovers. Here is a breakdown of options. Served with roasted potatoes and a salad. Used in tacos or quesadillas. As the protein source in Lightened Up Salsa Verde Chicken Enchiladas. In a salad with Cilantro Lime Salad Dressing. 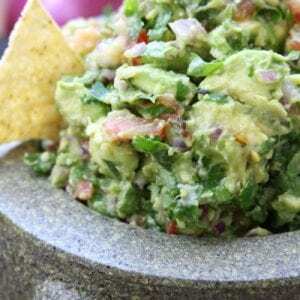 On top of nachos with Pico de Gallo, Simple Healthy Guacamole or Chunky Guacamole Salsa. Made into a Mexican Casserole. Used in my Mexican Chicken Avocado Sandwich. What should the final temperature of this whole roasted chicken be? The internal temperature of the chicken at its thickest part should be 165℉. What is the best way to test for the final temperature? This video is the perfect visual breakdown for checking the roasted chicken’s final temperature and this gadget will make it 10 times easier. 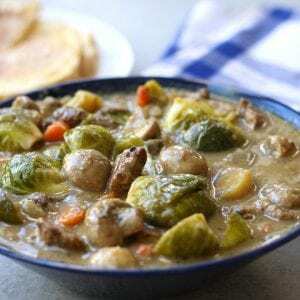 How do I reheat the leftovers? Reheating leftover chicken can be done by slicing and placing on a microwave safe plate. Reheat on power level 8 for 1-3 minutes. It is always better to start with less time and add more if needed. If microwaving is not an option, preheat oven to 350℉ and place chicken pieces in a small roasting pan. Cook for 15-25 minutes or until chicken pieces are heated through.